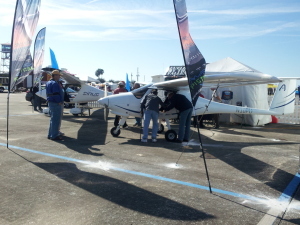 Each year, 16,000 attendees visit Sebring Regional Airport to see what the latest and greatest in the Light Sport Aircraft (LSA) market has to offer. With a new Wednesday through Saturday expo schedule, the 11th annual Sebring Sport Aviation Expo takes place January 14 through 17, 2015. Gates open at 8:00am Eastern each day, welcoming pilots and aviation enthusiasts to a day of demonstration flights, workshops, forums, special events and exhibitors. Among the exhibitors are the agents and pilots from Aviation Insurance Resources (AIR). AIR attends the Sebring expo annually to talk with LSA manufactures, owners and see the latest innovations in the industry. Since LSA certification was announced by the FAA, AIR has been a leader in providing light sport renters and owners with aircraft insurance at competitive rates. AIR shops all of the major market to ensure that you are getting the best rate and the broadest coverage available your light sport aircraft. With just one call, or a stop by their booth at Sebring, AIR can save you both time and money! If you are in the process of building or looking to build your very own LSA, AIR also offers a builders risk package customized with your needs in mind. AIR’s builders and restorers insurance plan offers flexible liability and hull coverage options, without worrying about pilot experience and history. This plan provides peace of mind that all your hard work will not go to waste. AIR is returning to the Sebring Sport Aviation EXPO in January 14-17, 2015. Stop by booth number T207 to see how we can assist you with your aviation insurance needs! To learn more about how AIR can assist you with your LSA policy, please contact Aviation Insurance Resources by calling 877-247-7767 or visit AIR-PROS.com today and receive an aircraft insurance quote! You can also follow us on Facebook, Twitter, LinkedIn, and Google+.